First some notation. I will number the squares (from 1-n). In this game, your character can only move between two squares if the sides match exactly. So, for each square, I will classify its sides with a letter. Two sides that can connect to each other will have the same letter, but different case (e.g. side X connects to side x). Top and left sides will use capital letters; bottom and right sides use lower case. We will label each opening in an side A as A1, A2, A3, etc… in order from top to bottom or left to right. I will use Level 31 in Continuity as an example. I have labelled this level in the below image. The labels just make it easier for a human to follow (and to input). Matching sides are labelled with letters. Construct a directed graph of connected points. There is a connection (edge) from p1 -> p2 if you can get from p1 to p2. That does not imply you can get from p2 -> p1 because of game physics (jumping and gravity), so this is a directed graph. First, inter-square connections (between different squares). Secondly, find the intra-square connections (within same square). Unfortunately, the only way to do this is inspect each square to see if it is possible to reach the opening via jumping inside the square alone. This was easily the longest (and most error-prone) part of the process. I won’t even list them all here because the list is so long. Finally, connections from special points to openings. Ah, these are the keys and doors in the game. Yes, there is still a game here ;-). Now we need to find a path that collects all keys and reaches the goal (door). The order of which keys to collect does not matter. Let’s just pick an arbitrary order of key collecting. Then find a path from <Start> to <key1> … <keyN> to <Finish>. Call these the checkpoints. One solution is to run some search algorithm from each checkpoint to the next, then concatenate the paths together. We could use common search algorithms (DFS, BFS) to traverse though the nodes until we find the goal. DFS backtracks when it reaches a dead end, while BFS searches all paths in parallel, one step at a time. A better way is to run a global shortest path algorithm, that finds shortest path from one point to every other point, such as Dijkstra’s algorithm. This algorithm is nice, because it only needs to check each node once, not doing any actual traversal. A bonus: We can select whichever order of collecting keys that gives the shortest total path. We can also give weights to the edges (e.g. I used cost = 1 to travel inside a square, but cost=10 to go between squares). This does not take into account how many moves are required in the macro puzzle to shuffle the squares around to make the desired connection. Assigning a weight to each inter-square connection equal to number of “shuffles” might work, except this number depends on the previous arrangement of squares. Thus we would have to track the state of the macro puzzle with each step in a DFS or BFS search, and the weight would only be valid for that state; we’d have to recompute at each new state. Not only that, but DFS/BFS are not well-suited for weighted search. It wouldn’t work at all using the Dijkstra’s shortest path method, since that relies on global costs of each path that are known beforehand to be unchanging. In any case, that is enough, because shifting two squares next to each other is extremely easy. Here is the best part about Python. It is extremely easy to go from pseudo-code of a Dijkstra’s algorithm to Python code, thanks to its built in list and dictionary types and short syntax. I used some object-oriented features (to encapsulate squares, each which hold a list of its points, each point holds an adjacency list of connected points), or you can go C-style and use global list variables like you would arrays. In fact, I ended up with a mix of both styles. Finding shortest path from Sq 5-A1 (left top) to Sq 8-b1 (right top). Finding shortest path from Sq 8-b1 (right top) to Sq 2-b2 (right bottom). Finding shortest path from Sq 2-b2 (right bottom) to key2. Finding shortest path from key2 to Sq 6-Z2 (top right). Level 31 again, for cross-reference. As a bonus, here is the best solution for Level 32 using the same technique. 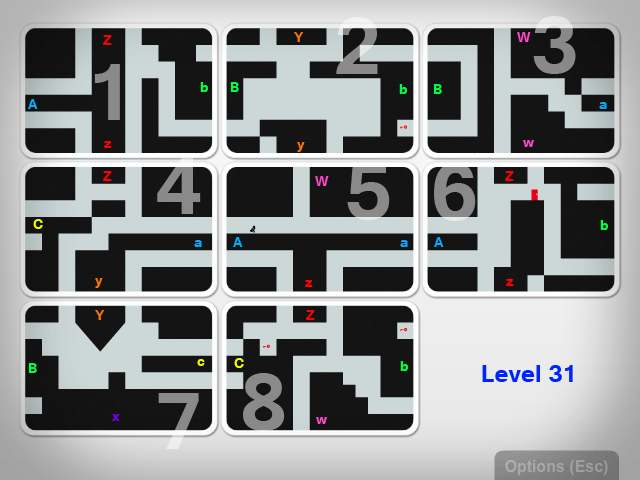 Being the last level, the difficulty is higher, and you can see because of the very few common sides between squares. Four of the sides do not even have a corresponding match (A, F, h, i). But it could be worse — at least all the bottom sides have some square to fall into! 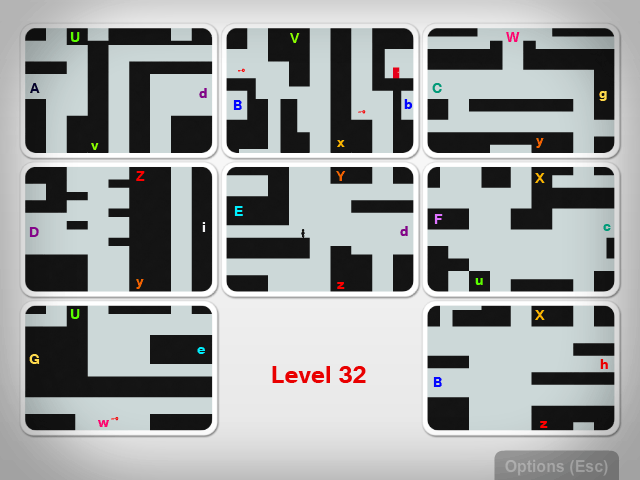 For this level, the shortest path for the best permutation of key collecting had distance 143 and the worst was 283. So that’s about half. Bet your Youtube video walkthrough didn’t have that information ;-). Finding shortest path from Sq5 Central Area to Sq 2-V3 (top right). Finding shortest path from Sq 2-V3 (top right) to Sq 7-w1 (bottom ). Finding shortest path from Sq 7-w1 (bottom ) to Sq 2-B1 (left top). Finding shortest path from Sq 2-B1 (left top) to Sq 2-b1 (right top).